A spacious two bedroom cottage with stunning views over Cotswold countryside. Enjoyed an absolute delightful vacation in this lovely and spacious cottage in a superb setting. Even the weather was kind to us in April. The accommodation was first class and the facilities excellent Everything needed for an enjoyable stay was provided. Only slight niggle was that we felt the mattresses in both beds were somewhat firm but that I guess is a personal taste matter. We're pleased you enjoyed the cottage and, of course, the weather! Thanks for the great review. We had a lovely short break at the cottage and it was in a ideal location walking distance to the town. The amenities in the cottage were good and the layout of the cottage was great for a family with a large living space and a log burner!! Will definitely recommend to others and hopefully be back ! We're pleased you and your family enjoyed Stonewell and thanks for recommending Park Farm to friends. We really, really wish you had said something about the shower at the time - that's what we're here for! We have been staying in Stonewell for several years now,it’s like a second home to us.Its a pre-Christmas break for all the family.Everything you need,perfect!!! It's always a pleasure to see you and your family at Park Farm. Thanks for the review. Clean, lovely, spacious cottage. Great location and dog friendly. Also good level access for my elderly parent. Thanks for your lovely comments. We're pleased the cottage suited you both so well. We had a lovely break in the Cotswolds staying at Stonewell earlier this month. The cottage had all we needed and was so easy to find. It's the first time I've not got lost on the way to a holiday cottage! If you're visiting out of season, I recommend Sudeley Castle as they are open until the end of the year unlike National Trust places. It was an excellent day out. Thank you so much for the great review and it's especially good to hear that our travel directions are useful! Maugersbury is a lovely place to be and Stonewell is an excellent cottage to enjoy the location. I never tire of the view across the valley or the walks from the door. The restaurants, cafes and shops of Stow are just a 15 minute walk away along a lovely traffic free lane. We're pleased you enjoy the walk into Stow and continue to love all that Stow has to offer. Thanks for the review. Stonewell is a beautiful, spacious and extremely well equipped holiday cottage. 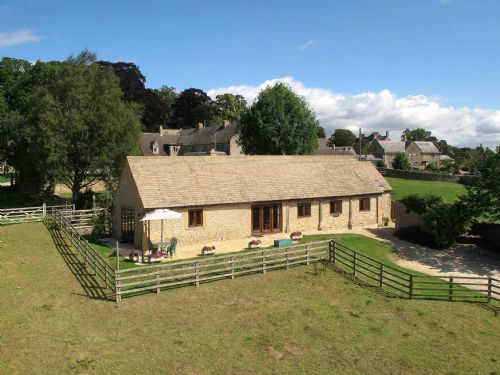 It is really well located, with beautiful views across open countryside, but only a short walk from Stow on the Wold. The owners were helpful both before and during our stay, but were unobtrusive. Everything you could need for a holiday stay had been considered. We had a wonderful time and would definitely recommend Stonewell to others looking for a place to explore the Cotswolds from. We hope to return ourselves. Thank you so much for your great review. We're really pleased you enjoyed your stay in Stonewell. Always just perfect. A few unforeseen minor problems dealth with immediately. Don't need more characters- can't improve on excellence. It's always a pleasure to see you both at Park Farm. My stay at Stonewall was exactly what I was looking for, a comfortable warm cottage in the Cotswolds to rest and relax. The cottage and setting were perfect and my dog and I especially loved the quiet walks. He loved playing with the friendly dogs who belong to the owner and they have set up a great enclosed space for him to run. Would definitely go back again. Our dogs, Ginny and Paddy, loved playing with Oscar and we'd all love to see you both back at Park Farm! Thanks for the review. We have been to Park Farm before and it was just as we had hoped. Spotless accommodation right through and all the essentials (tea, coffee biscuits and milk in the fridge too). This is one of the best self catering places we have ever been to. Location is a 10 minute walk from Stow or a few minutes in the car. It was good to see you at Park Farm again. We're pleased you enjoyed your stay and thanks for the great review. Loved everything about it. Quaint, but modern amenities. Wonderful view. Fire in fireplace in evening. Very comfortable. Would stay there again in a heartbeat! We're pleased to know you were comfortable in Stonewell. Thanks for the great review. We had a fantastic break in the Cotswolds. Stonewell was ideally situated to explore. It has charming features and all the luxuries of a home from home. We're pleased you enjoyed exploring the Cotswolds. Thanks for the review. Very nit and tidy cottage. Landlord's hospitality is excellent. Cottage location is close to nearby local town where is amazing to visit. We're pleased you enjoyed our local market town of Stow-on-the-Wold. Thank you for your review. We had a great time staying in Stonewell. The location was ideal for us with many great walks in the area including the short walk into Stow with it's many excellent pubs and restaurants. Having the secure dog field was a real plus as we have 2 dogs who can not be let off the lead so free space for them to run in was great - they loved it. The property was well equipped, great local information available and as a family of 4 having 2 bathrooms was ideal. The Bell in Stow served excellent food and the staff there were very friendly - highly recommended. Tiana and John made us feel very welcome, we all had a great week (including the dogs) and hope to return again in the future. Thanks for the review and for bringing your beautiful dogs - we just loved watching them! Tiana and John are friendly and helpful and have gone the extra mile to provide guests with everything they need for a perfect stay. We found Stonewell to be exceptionally well equipped and well located to explore the area. With lots of information on places to visit, suggested walks with take out maps, and great views from the patio area. A member of our party had minor mobility problems and was able to manage. Slope and one step in to cottage. Some grab rails, large wet-room with shower chair. Tiana even provided a 4-wheel Rollator walking aid! Thank you for the review. We were just happy to help. A great cottage with excellent facilities both inside the cottage, and outside in the grounds. The perfect location for our family holiday - close to the town and a great base for exploring the greater Cotswolds region. Stonewell cottage is a lovely two bedroom cottage which is finished to a high standard and is very well equipped. It is set in its own grounds which gives privacy and has its own outside patio area for BBQ's etc. It was cleaned to a very high standard for our arrival. The owners, Tiana & John have set up a great facility on site for games including tennis court, badminton, croquet, and table tennis. Also if you have a dog there is a paddock to exercise it in next door to the cottage - complete with agility obstacles! A great holiday location. Thanks for the review. Our dog, Ginny, really enjoyed playing with your dog too! Relaxing holiday in a very comfortable dog friendly cottage, set in a picturesque location within walking distance of Stow on the Wold. The cottage was very clean and furnished as a home from home. There were beautiful views from the cottage and several walks from the front door. As dog owners we particularly appreciated being able to exercise the dogs in the safe paddock, and they enjoyed playing with other dogs and the agility equipment. I would highly recommend this cottage. Our dog, Ginny, loved playing with your two dogs too! Thanks for taking time to review the cottage. We stayed in stonewell for a week. Its a great location and Tiana showed us the short cut in to the village. Stonewell is great for a family as its all one level with lots of room outside for children to play. Tiana and John have a selection of garden games which our family enjoyed. Stonewell is very nicely decorated and wonderfully clean. We felt safe and very welcome thanks to John and Tiana’s hospitality. We will be going back. Great comments, thank you. We find that garden games provide multi-generational fun! We would highly recommend Stonewell. We very much enjoyed our stay at Stone well.We enjoyed the tranquil setting with the added bonus of horses close by. The barn was of a high standard and had some interesting features particularly the illuminated well in the lounge. We liked the decor and pictures and the en suite wet room was a bonus. (This room was also disabled friendly). Our dog enjoyed the dog paddock and local walks.I would highly recommend a stay here. Thank you, it's a pleasure to have you staying at Park Farm. A lovely place to stay in the Cotswold. We stayed here along with family in Stonewell and Oxbow. It’s a beautiful spot with wonderful views over the countryside. Plenty of places to visit nearby. You have everything you need, very comfortable. Stonewell with its large sitting room was perfect as the hub for our family gathering which filled all the cottages plus others staying in Stow. In spite of the cold weather which made cosy log fires necessary, we had an enjoyable week, or long weekend. Park Farm Cottages are well situated for access to Stow and the surrounding area. Stonewell in particular was well equipped with everything we needed to make a comfortable stay. The other cottages seemed to all have storage heaters which took a day to get the hang of, but are then fine. Thank you Tiana and John, it was lovely. We're pleased that Park Farm Holiday Cottages suited your big family gathering. It's always good to see a group of guests enjoying a great get-together. Stonewell and Park Farm is like our second home and Tiana and John are the perfect hosts. At various times all our family have joined us there and they all share our view. Keren, thanks for your review - we always enjoy your being here at Park Farm!